This is a very royal cat, resting on a pillow. Dangling from the pillow are small charms of a fish, ball of yarn and a mouse. 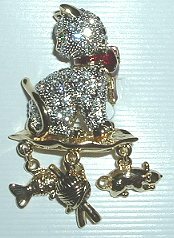 This rhinestone cat has green eyes and a red bow around its neck. This cat pin is 1 5/8" high x 7/8" wide.